This week is the Dante Week for readers of my book The Word in the Wilderness, my compilation of a poem a day for Lent. In that book I give three poems from my sequence of nine written in response to the Commedia but I thought I might repost all nine on this blog for those who were interested in following up the sequence. You can read the first poem in my dante sequence (which is not in Word in the Wilderness, by clicking on this title: In Medias Res, If you would like to read through and listen to all nine poems in my Dante Sequence, which is published in the Singing Bowl, you can do so by starting HERE and then following links to subsequent posts. 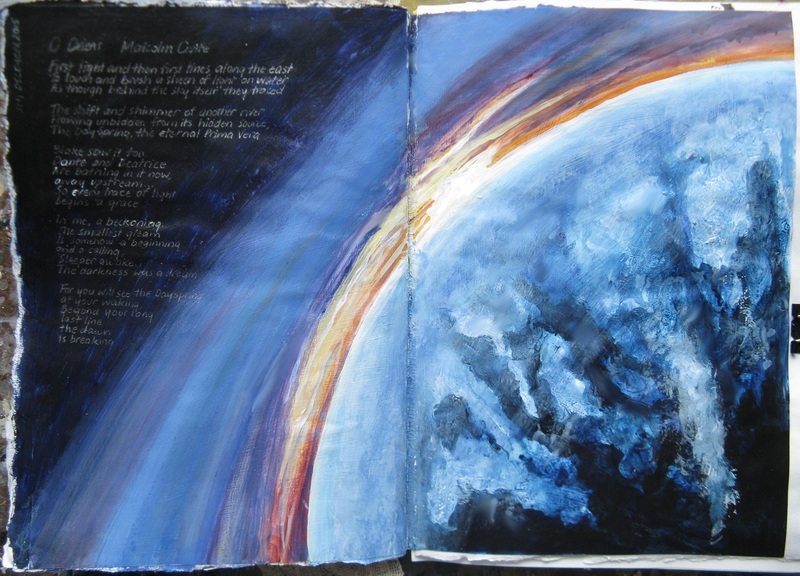 Today I am posting the Fourth, De Magistro.’ This poem is set for Thursday in The Word in the wilderness and the introduction is taken from that book. Many of us can probably point to a figure like Virgil in our lives, not only an author, but a living friend and teacher, who meets us at the right moment, sets us on a good path and guides on our journey. In this poem, I celebrate someone who did that for me, the teacher, in fact, with whom I first read Dante. My poem takes its point of departure from the moment of transition we considered in Wednesday’s end of the Inferno when the poets emerge at last from the dark and see again the sky and stars, and their preparation to begin the painful and yet joyful ascent of Mount Purgatory. Again and again I find Dante’s poem gives me glimpses of places I have been, and places I may well yet find myself, and in doing so it gives me a map, and with the map, a way forward. When I wrote this poem I was emerging from period of depression. I was grateful to be past the worst but I realized that I had work to do, things to redeem, an ascent to make. To do so I had to call to mind all the resources available to me, and I found myself summoning the powers of the poetry I had read, the insights and example of the teachers who had guided me, and above all concentrating, as they had done, on the joyful task of teaching itself. The title of this poem, ‘De Magistro’, means ‘Of the Teacher’ and it is also the title of a little book by St Augustine, co-written as a dialogue with his beloved son Adeodatus, in which father and son explore together what it means to learn and to teach and come to the conclusion that at any moment when we suddenly ‘recognize’ a truth, and make a glad, inner assent to it, it is not the outward and visible teacher, the person in the room, who is the ultimate source of that truth and that assent, but rather an ‘inner’ teacher, deep within us, a source of light and truth to whom we have brought each proposition for confirmation, and that teacher, said Augustine is Christ, himself, the Logos, the Word in each of us, who guides us through the wilderness. At such moments of joyful recognition both teacher and pupil discern the Word in and through one another, and in and through the words they share. Perhaps, in the midst of this Lenten journey this is a good time to remember, give thanks and pray for those teachers, official and unofficial, through whom Christ has ‘brought us safe thus far’. As always you can hear my poem by clicking on the title or the ‘play button’. I am grateful to Oliver Neale for the contemporary image that follows the poem. as fellow pilgrims on a needful journey. So Dante begins again, accompanied by Virgil and they come to the very gate of Hell, with its famous inscription ‘Abandon Hope All Ye Who Enter Here’! But they don’t abandon hope, and that is the whole point. It is hope that leads and draws them on, hope inspired by love. 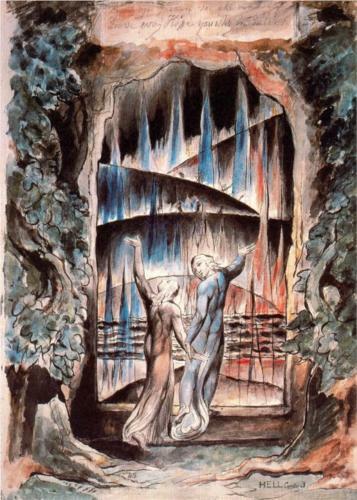 For Virgil has revealed to Dante that it is Beatrice, the woman with whom he had fallen so completely in love as a young man, now in the bliss of Heaven, who has herself ‘ventured down the dark descent’ (to borrow Milton’s phrase) to find Virgil and ask for his help in rescuing Dante, so that she and Dante can meet again and rise together through the spheres of Heaven. Like Jesus, who went to the cross, not for pain in itself, but ‘for the joys that were set before him’, so we are to make this journey through the memories of pain and darkness, not to stay with these things but to redeem them and move beyond them. And the journey is itself made possible because Christ himself has gone before. ‘He descended into Hell.’ Throughout the journey into the Inferno we are shown signs that Christ has been this way before and broken down the strongholds. Dante is here alluding to one of the great lost Christian stories, which we need to recover today; ‘The Harrowing of Hell’. We, who build so many Hells on earth, need to know that there is no place so dark, no situation so seemingly hopeless, that cannot be opened to the light of Christ for rescue and redemption. 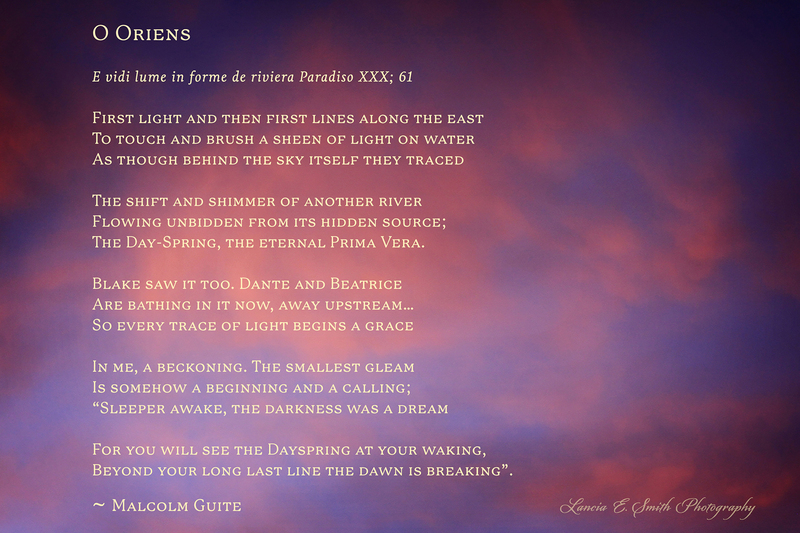 This is the theme I have born in mind in the following poem, which is my own ‘reader response’ to Dante’s journey. Throughout I have been mindful that the Inferno is really ‘in here and right now’ not ‘out there and back then’, and emphatically not, if we trust in Christ, some inevitable end awaiting us. In that knowledge we must have the courage to expose our own personal Hell’s to Christ and let him harrow them with us, and that is precisely what Dante’s great poem allows us to do. The great statesman and Dante enthusiast, W. E. Gladstone said: ‘The reading of Dante is not merely a pleasure, a tour de force, or a lesson; it is a vigorous discipline for the heart, the intellect, the whole man’. For all of us, somewhere within, there is a threshold or a gate beyond which we feel we dare not go, but it is sometimes just past that threshold that our real healing and restoration needs to take place. Sometimes the best way to get through that gate, and let Christ in, is in a companioned inner journey, with a trusted ‘soul friend’, a spiritual director, or a priest to whom we can make confession in complete confidence. 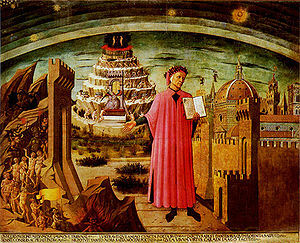 I have deliberately echoed the phrase, from the form of confession ‘All I cannot call to mind’ as a way of suggesting that this journey with Dante down the dark spirals; one sin leading to another, one wound inflicting the next, can itself be an invitation to confession, and so to absolution and release. 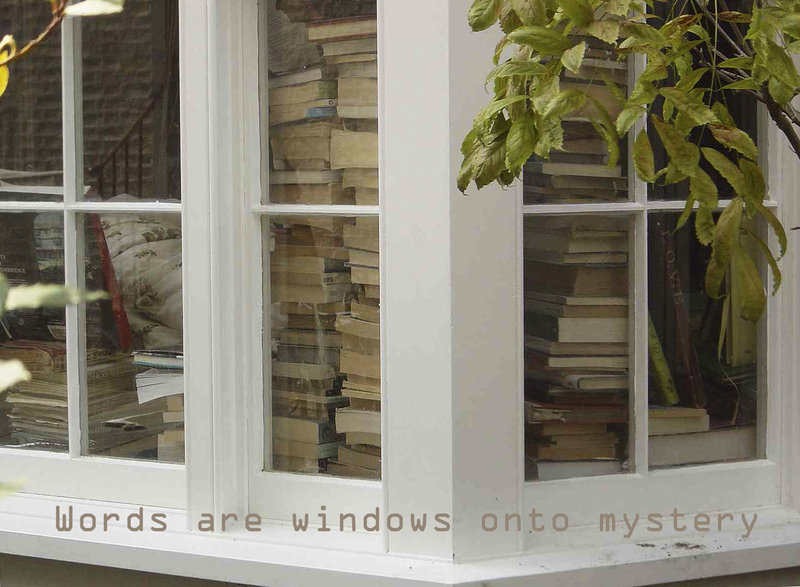 As before, you can hear the poem by clicking on the ‘play’ button or the title. 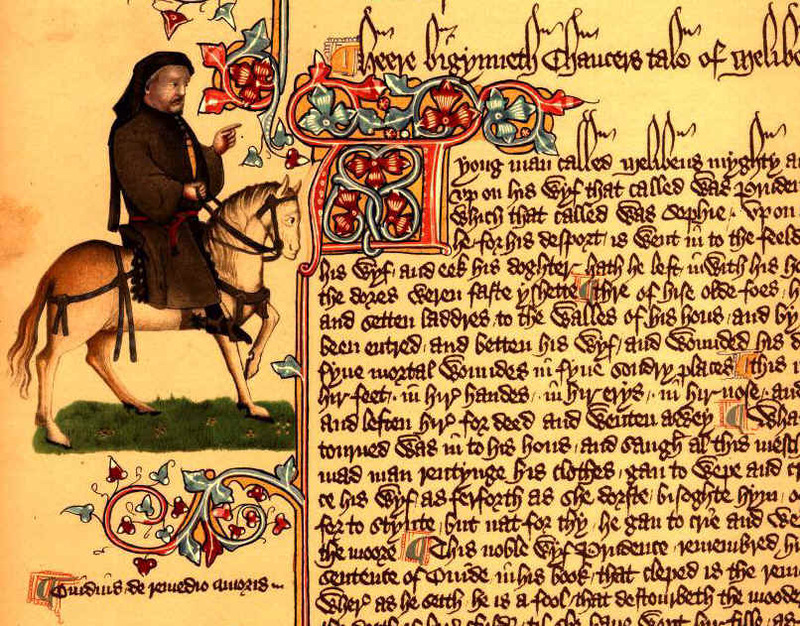 During this last Lent Term I preached a series of seven sermons at Girton College, exploring the theme of pilgrimage, first in scripture and then in the writings of Dante, Chaucer, Raleigh, Herbert, Bunyan, and CS Lewis. These are now up on the college website as audio clips you can listen to onsite or download for later listening. Here are links to all seven. Sunday 15 February: Choral Evensong Speaker: Revd Dr Malcolm Guite. Title: Herbert: Notes on the journey.